By the time Bob celebrated his 75th birthday, he was having trouble recognizing the faces of his neighbors—people he’d known for more than 20 years. Simple tasks such as reading food labels, doing crossword puzzles, and reading his favorite magazines now were a challenge. Bob was experiencing the life-altering effects of age-related macular degeneration (AMD), one of the leading causes of blindness among older adults in the United States. Following is a discussion on AMD and the foods and nutrients that research shows may prevent and slow its progression. “What is significantly impacted by macular degeneration is facial recognition and reading. Those are the big complaints we hear from people with the disease,” says Jennifer Kaldenberg, MSA, OTR/L, SCLV, FAOTA, an occupational therapist and clinical assistant professor at Boston University Sargent College of Health & Rehabilitation Sciences and an adjunct faculty member at the New England College of Optometry & New England Eye Institute, who specializes in working with adults with vision impairment. • Age: Adults aged 50 and older are at increased risk of AMD, and that risk continues to rise with age. • Genetics: Patients with a family history of AMD are believed to have an increased risk of developing the disease. • Smoking: People who smoke are said to be twice as likely to develop AMD as nonsmokers. • Race: Whites are significantly more likely to develop AMD than people of African descent. These findings established the first demonstrated AMD treatment that medical professionals could recommend to patients with diagnosed intermediate to advanced disease in hopes of slowing its progression.4 What followed was the introduction of several brand-name supplements to the public containing roughly the same antioxidant formulation used in the AREDS study. The findings from both AREDS studies, as well as subsequent research that upholds these findings and suggests there are no apparent side effects from long-term supplementation, have convinced eye health professionals to recommend an AREDS-type supplement to patients at risk of developing advanced AMD.7,8 “The retina community feels strongly that the beneficial affects of the nutrients are real and worth putting people on the supplements,” says Marc Levin, MD, a board-certified retina specialist and clinical assistant professor at the University of Illinois College of Medicine. Given the relationship among healthful foods, certain nutrients, and AMD development, nutrition professionals can educate clients and patients who are either at risk of or already have been diagnosed with the disease. 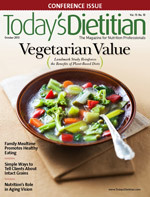 Ruth Frechman, MA, RD, CPT, a spokesperson for the Academy of Nutrition and Dietetics, believes dietitians should have greater awareness of their role in AMD prevention, since the typical diet of many Americans is low in nutrients and antioxidants such as lutein and zeaxanthin, which are important to eye health. “If we get enough of these nutrients through food, or even supplements, our blood levels do go up and therefore can protect the eye from damage,” she says. 1. Identify individuals at increased risk of developing AMD by using questionnaires to determine who may have AMD risk factors, including those listed previously. 2. Discuss dietary habits and lifestyle behaviors that may help prevent AMD. As mentioned, encourage clients to eat foods rich in vitamin C, omega-3 fatty acids, lutein, and zeaxanthin, which have been shown to support eye health (see below). 3. Refer at-risk patients to an eye health professional. When AMD is detected early, nutritional supplementation can help prevent AMD development or delay its progression. Knowing about AMD risk factors, adopting a diet rich in nutrients that support eye health, and practicing healthful lifestyle behaviors all enable a person to avoid the potentially devastating affects of AMD. Dietitians can be instrumental in giving that power to their clients and patients. Looking ahead, additional research hopefully will further clarify how food and nutrients can serve in primary prevention of this leading cause of blindness. These two nutrients are found in high concentrations in the macula, a small region in the center of the retina—a light-sensitive layer of tissue that lines the inner surface of the back of the eye—that contains millions of light-sensing cells known as photoreceptors responsible for clear central vision. Lutein and zeaxanthin act as antioxidants, protecting the eye from environmental damage caused by smoking, pollutants, and sun exposure. Food sources: Dark, leafy, green vegetables such as spinach, kale, and collard greens. It’s found in lesser amounts in broccoli, Brussels sprouts, corn, romaine lettuce, peas, and eggs. These polyunsaturated fatty acids support eye health by preventing arterial plaque buildup and also reducing inflammation and blood vessel and cell damage. Food sources: Cold-water fish high in both DHA and EPA, such as wild salmon, herring, sardines, tuna, or cod liver oil. Plant-derived omega-3 fats are found in flaxseeds, walnuts, and dark green, leafy vegetables. Zinc plays a role in bringing vitamin A from the liver to the retina to produce melanin, the protective pigment in the eyes. Zinc is concentrated in the retina as well as the vascular tissue layer underneath the retina. Food sources: Red meat, seafood, poultry, pork, oysters, eggs, nuts, tofu, baked beans, wheat germ. Vitamin C is actively concentrated in eye tissue and supports the health of ocular blood vessels. Food sources: Citrus fruits, including oranges, lemons, limes, and grapefruits, as well as red peppers, tomatoes, and spinach. Vitamin E is an antioxidant for the eye, protecting it from environmental damage and free radicals that harm healthy eye tissue. It plays a role in vital biological processes, such as DNA repair, and maintains healthy cell membranes. Food sources: Nuts, such as almonds and peanuts, as well as sunflower seeds, vegetable oils, wheat germ, fortified cereals, and sweet potatoes. 1. Common eye disorders: age-related macular degeneration. Center for Disease Control and Prevention website. http://www.cdc.gov/visionhealth/basic_information/eye_disorders.htm - a3. Last updated April 23, 2013. Accessed July 31, 2013. 2. National Eye Institute. Age-Related Macular Degeneration: What You Should Know. Washington, DC: US Department of Health and Human Services; 2009. NIH Publication No. 09-2294. 3. Age-related eye diseases study—results. National Eye Institute website. http://www.nei.nih.gov/amd/background.asp. Accessed July 31, 2013. 4. Antioxidant vitamins and zinc reduce risk of vision loss from age-related macular degeneration. National Eye Institute website. http://www.nei.nih.gov/news/pressreleases/101201.asp. October 12, 2001. Accessed July 31, 2013. 5. NIH study provides clarity on supplements for protection against blinding eye disease. National Eye Institute website. http://www.nei.nih.gov/news/pressreleases/050513.asp. May 5, 2013. Accessed August 2, 2013. 6. Question and answers about AREDS2. National Eye Institute website. http://www.nei.nih.gov/areds2/MediaQandA.asp. Last updated May 2013. Accessed August 2, 2013. 7. Chew EY, Clemons TE, Agrón E, et al. Long-term effects of vitamins C and E, β-carotene, and zinc on age-related macular degeneration: AREDS report No. 35. Ophthalmology. 2013;120(8):1604-1611. 8. Sin HP, Liu DT, Lam DS. Lifestyle modification, nutritional and vitamins supplements for age-related macular degeneration. Acta Opthalmol. 2013;91(1):6-11. 9. Tan JS, Wang JJ, Flood V, Mitchell P. Dietary fatty acids and the 10-year incidence of age-related macular degeneration: the Blue Mountains Eye Study. Arch Ophthalmol. 2009;127(5):656-665. 10. Christen WG, Schaumberg DA, Glynn RJ, Buring JE. Dietary ω-3 fatty acid and fish intake and incident age-related macular degeneration in women. Arch Ophthalmol. 2011;129(7):921-929. 11. Ho L, van Leeuwen R, Witteman JC, et al. Reducing the genetic risk of age-related macular degeneration with dietary antioxidants, zinc, and ω-3 fatty acids: the Rotterdam study. Arch Ophthalmol. 2011;129(6):758-766. 12. Gerstenblith AT, Baskin DE, Shah CP, et al. Electroretinographic effects of omega-3 fatty acid supplementation on dry age-related macular degeneration. JAMA Ophthalmol. 2013;131(3):365-369. 13. Nutrition and AMD. American Optometric Association website. http://www.aoa.org/patients-and-public/eye-and-vision-problems/glossary-of-eye-and-vision-conditions/macular-degeneration/nutrition-and-amd. Accessed August 2, 2013.